Who doesn’t love a bowl of piping hot buttery mashed potatoes? You can make this side dish that everyone will love. It isn’t difficult to make these buttery mashed potatoes and serve them up for your next dinner. 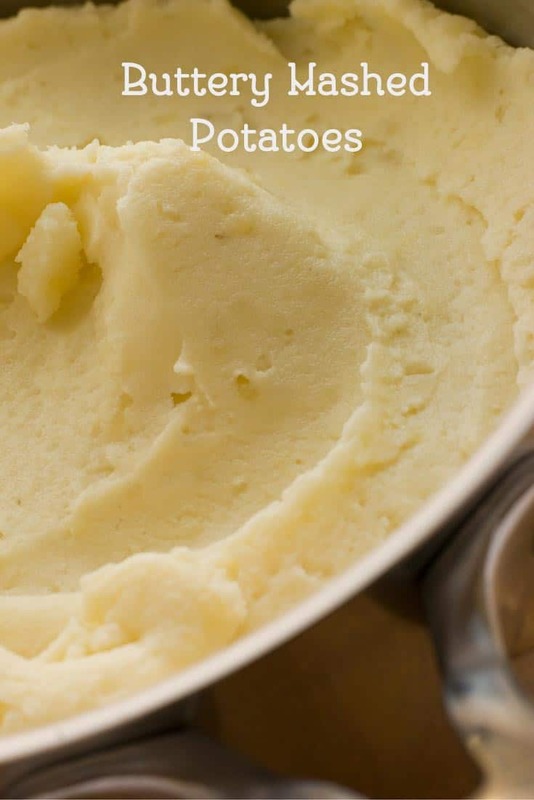 Buttery mashed potatoes aren’t difficult to make; you can make the best-mashed potatoes ever with this simple technique and the right choice of potatoes. When I want to make a bowl of mashed potatoes, I like to use Yukon Gold potatoes. Yukon Gold potatoes have a thin skin and yellow flesh inside, and this potato has a naturally buttery flavor. You can use Russet potatoes for this recipe, but if you get a chance to try the Yukon Gold, I think you will prefer them just like I do. This method also varies because instead of using a mixer to prepare these mashed potatoes we are going to use a potato ricer. The potato ricer will help to protect the cell walls of the mashed potatoes, so they don’t get gummy. If you have ever had gummy mashed potatoes, it is because they have been overmixed and the cell walls of the potato have burst. We are going to use whole milk for these potatoes; this is one time I suggest that you don’t use 2% milk or any other variety of milk. In fact, my personal preference would be to use half and half, or even cream instead. For an everyday bowl of mashed potatoes, whole milk has the best flavor and not too many calories. We are going to infuse the milk with herbs. Thyme is an excellent addition. If you like, you could add a slice or two of onion in your milk too. The soaking of the herbs with the milk adds a nice subtle touch that you and your family will love. You have never had mashed potatoes so good. ile the potatoes are cooking heat together milk, butter, and herbs on low. When the potatoes are done, drain the excess water from the potatoes. Place potatoes in either a potato ricer or a food mill. Remove herbs and onion (if used) from the milk, and add milk to the potatoes. Stir quickly. The potatoes may become gummy if allowed to cool too much. Season with salt and pepper to taste. I like to add sour cream and/or cream cheese to my mashed potatoes in place of or in addition to the milk. I think it makes them extra creamy, rich and flavorful as a result. I’m curious to try the buttermilk though. Love the recipe. However, for a different take — use buttermilk! (My wife is Serbian, and I was going to surprise her by making mashed potatoes. The markets in Belgrade don’t have ‘buttermilk’, but they have a very similar product marketed as yougurt, (actually I think it really is buttermilk, but hey — I’m not Serb!)). Anyway, I boiled the potatoes, and while doing so, heated the yougurt with some salt, pepper and parsley flakes and some garlic powder. Stirred in the warm yougurt and about half of stick of butter to the riced potatoes (yep! brought my personal ricer with me). Wife and in-laws and stepdaughters couldn’t get enough of them. When I got back stateside, I made same way only used regular -off-the-shelf buttermilk the next time I made them. Thanks for your recipe, will try it on my wife and family soon! I totally want to make your mashed potatoes very soon. They sound completely delicious.